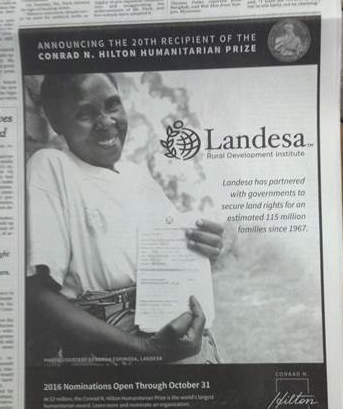 Congratulations to Welter Consulting client Landesa which was the recipient of the 2015 Hilton Humanitarian Prize. Each year, the Conrad N. Hilton Foundation reviews hundreds of nominations from notable nonprofit organizations from across the globe, and an independent, international panel of distinguished jurors makes the final selection after a rigorous vetting process. Landesa, by partnering with governments in more than 50 countries, has promoted land-related laws, policies and programs that free women and men to climb out of poverty, feed their families, and send their children to school. Since its founding in 1967, Landesa has partnered with governments on reforms that have provided secure land rights for an estimated 115 million rural families across the globe. Landesa has also taken on the role of elevating land rights on the global development agenda. It has been a champion of land rights within the Sustainable Development Goals and speaks at global policy forums, from the G-8 to Davos. In this work, Landesa has made great strides in raising the international profile of land rights issues, and as a result, the UN now includes land in three of its Sustainable Development Goals. With the Hilton Humanitarian Prize, Landesa will be able to help even more people. We are so very happy for our client, based right here is Seattle, to receive such a extraordinary award. Welter Consulting is proud to be a sponsor of PAVE’s annual auction and dinner, this Saturday, October 17 at the Tacoma Country and Golf Club. PAVE is a Washington-based parent organization providing support, advocacy, training and informational resources to empower families and individuals with disabilities. We are happy to support PAVE which is both a client and a great resource to our community. 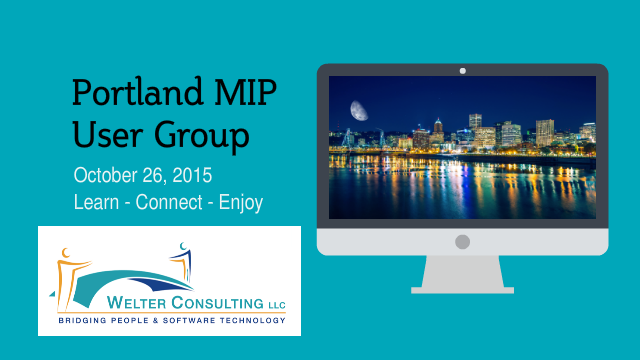 Welter Consulting is teaming up with RBP Methods to offer an Abila MIP User Group in Portland in order to make participation easier for clients close to the Portland area. Click here to register. What’s New: a review of v2014, 2015 features including bank reconciliation, emailing payment vouchers, advanced security, security changes, UI, alerts, and much more. What is MIP Advance and is it for me? Cloud Computing: the benefits and drawbacks of cloud computing (hosting). ACA reporting tools in HR Management and EWS/Microix TS. Advanced Reporting Module (DrillPoint) Excel-based add-on module that allows for custom reporting and dashboards. 20 Best Tips & Tricks and 10 Best Reports. Stump the Chump and MIP Jeopardy! Test drive MIP and Microix modules or find out more about other 3rd party billing options.